It's been hard to miss the message over the past year that we're in a drought. And Californians have responded remarkably well: residential water use was reduced by 9.4% in Santa Clara County, 12% in Los Angeles County, and up to 25% in San Diego County from previous periods. I still see far too many gratuitous lawns, thirsty "exotic" plants and wasteful irrigation systems. But on the whole, we're at least trying to handle our water. First, let's assume we're in for nine inches of rain — that's 3/4 foot — over the next week or so. Second, let's assume we can harvest that rain from the roof of our detached 2-car garage, which has a roof area (equals footprint) of about 20 feet by 20 feet. So if we catch every drop that falls on our roof, we would harvest 20' * 20' * 3/4' = 300 cubic feet. Using a handy-dandy volume converter, we find that 300 cubic feet equals 2,244.156 gallons. Holy crap! Seriously?! More than two thousand gallons? That can't be right. Well, actually, it isn't right. Because we won't catch every drop. Some will splash away, some will get trapped in the gutters, some will leak out. So a capture rate of 60% is usually considered reasonable, and our potential volume actually is 2,244.156 * 60% = 1,346.494 gallons. Holy crap! Seriously?! More than thirteen hundred gallons? Yep. And unfortunately, that huge number is less than 5% of the annual water needs of a 1,000 square foot lawn. Never mind that if you're serious about water conservation, you don't have a 1,000 square foot lawn; are you getting a sense of the quantity of water we're talking about? Say you did have a 20'x50' patch of grass: 1,346 gallons of rainwater would irrigate it for all of about two weeks. For the year you'd need twenty times that, or around 27,000 gallons. Which raises another issue, specific to Mediterranean climates like ours where most of the rain comes in one season, as opposed to throughout the year: storage. We get most of our rain during the winter, when plants are dormant and evapotranspiration rates are low. We don't need the captured rainwater now. We need it six to nine months from now, when skies are sunny and the ground is parched. Even if you have no lawn and your xeric garden only needs 1,300 gallons, where do you store what you've saved? 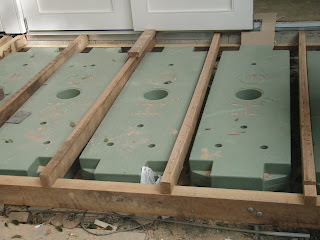 There are in-ground cisterns, which may be large enough but are pricey and complicated to install. 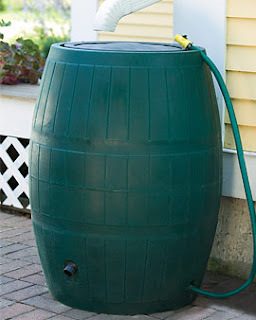 There are classic, above-ground rain barrels, which are bulky and difficult to link together for additional capacity. 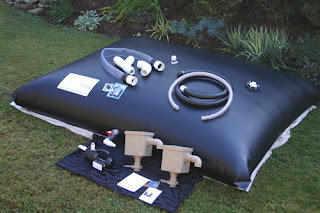 There are interesting systems like the Rainwater Pillow which can efficiently store 1,000 gallons or more, but may not be ideal for exposed outdoor locations. And there are modern above-ground tanks such as the Rain Box and Rainwater Hog, which link together with slim rectilinear profiles that use space efficiently but can become pricey. How pricey? The Rainwater Hog sells in the neighborhood of $500 per 50-gallon tank. To catch 1,346 gallons requires 27 tanks, or $13,500. The Rain Box is more economical, at about $250 per 75-gallon box. But that's still 18 boxes, or $4,500. Even if cost isn't a consideration, space may be. The Rainwater Hog has such a slim profile — just 20" wide by 10" deep — that it can be mounted not only vertically against walls, but also horizontally, e.g. beneath a deck. But no matter how you set them up, 27 tanks would take a lot of room: far more than the 20' wide wall of our two-car garage. The Rain Box is bigger, about 24" wide by 20" deep, and not designed to mount horizontally; so 18 boxes would need at least 36', or almost two full walls of the garage. I don't mean to discourage anyone from catching and reusing every drop possible. Even if your "rain barrel" is a garbage can, that's 20 or 30 gallons you don't need to draw from a reservoir. But it won't be your only solution, and in fact might raise more questions, e.g. what do you do with the overflow? We all can install green roofs, detention basins and porous paving, which will help the rain get into the groundwater where it actually can do some good. But these solutions aren't the same as storage; and they're not cheap, either. I guess my point is that it ain't easy to save the world. It's probably not economical, and you probably won't get your money back. Serious rainwater harvesting requires some serious commitment, and we're not all there just yet. But even if you're not ready to shell out thousands of dollars to store thousands of gallons, you have plenty of other options. Maybe you can swap out your lawn for a delightful garden of unthirsty plants. Maybe you can mulch those plants with 3" of compost instead of leaving the soil bare. Maybe you can redo your driveway with pervious pavers instead of asphalt. Maybe you can take shorter showers or make other changes that reduce your water footprint. Maybe you can't do much; but you can do something. And what better time to start than now — while there's a break in the weather?